Choral fans will be very excited about the meeting of two of the most versatile musical minds of their generation, Rutter and Bennett in a CD that is Gramophone Magazine's Editor's Choice for May 2005 and on many lists for Choral disc of the year. 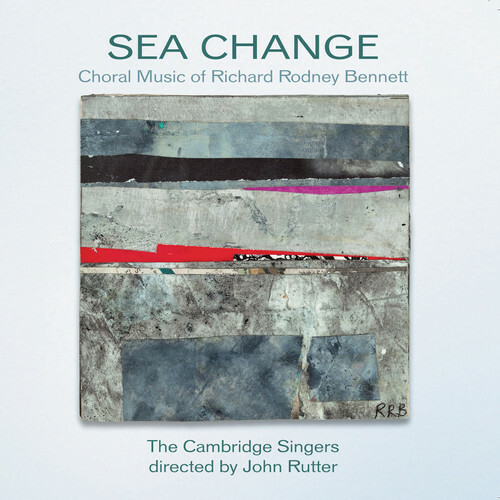 The title work, "Sea Change," set to texts by Shakespeare, Andrew Marvell and Edmund Spenser, is 4 pieces, sometimes Britten-esque, dramatic, swirling, agitated, emotional, dissonant and always interesting. "A Farewell to Arms," written for the ensemble VocalEssence for a cappella choir and solo cello, are poignant poems of an old soldier's recollection of war. "A Good-Night " is a lovely motet written in memory of Linda McCartney. The last 8 tracks feature some of Bennett's most accessible works, which happen to be Christmas songs. "There is no rose," "Out of your sleep," "That younge child," "Sweet was the song," "Susanni," "Lullay mine liking" and "What sweeter music" are simply beautiful. The Cambridge Singers, directed by Rutter, are perfect, handling this difficult material with ease. "Sea Change" is a rare, very special recording!